Yellow fever is a potentially fatal viral disease that is transmitted by mosquitoes in parts of South America and Africa. Immunisation is required for travellers to these parts of the world. Vaccination is still strongly recommended for travellers who have never been vaccinated for yellow fever and who intend to travel to countries where there is a risk of transmission. Border biosecurity processes will remain in place for unvaccinated travellers. 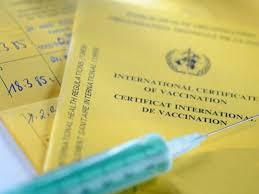 All adults and children over the age of 1 must hold an international vaccination certificate if, within six days before arriving in (or returning to) Australia, they have stayed overnight or longer in a declared yellow fever infected country. Travellers should seek medical advice on vaccination for their individual medical circumstances, particularly about the suitability of yellow fever vaccine for infants, pregnant women and those who are immuno-compromised.